the health and care services that matter so much to all of us for our own wellbeing, for those whom we love, for our friends and neighbours, were shaped and designed by informed and empowered communities, alongside frontline staff and planners. And imagine if ‘making care better’ was much more than the title of a strategy, and drove every encounter, and every aspect of service design and delivery. This last point specifically reflects the challenge and opportunity facing Healthcare Improvement Scotland in implementing its new, five year strategy. The strategy sets out the organisation’s vision of how it can support the delivery of better quality health and social care for everyone in Scotland. However, if we are serious about achieving this, we need to make sure that ‘making care better’ is a genuine statement of intent rather than merely becoming a sound bite or strapline. If we are truly to make a real and valued contribution to improving care in Scotland, we need to have open and honest conversations, including on the most challenging issues in service delivery, with those that have the greatest vested interest in health and social care: people and communities. Crucially, the strategy recognises the importance of meaningful and impactful engagement; and underlines our commitment to listen and learn from the people that use health and social care services every day. It’s also vital that we continue to make connections and find new ways to engage and collaborate with other organisations, including those in the third and independent sector, as well as statutory bodies, that have a shared interest in improving care. Our health and care services are continuously evolving, not only to meet the changing needs of our population, but also in response to developments in clinical practice, technology and increasing pressure on financial resources. The integration of health and social care has signalled a landmark change in how services are designed and delivered, but we know that much more needs to be done in order to achieve changes that are fit for purpose for the next era, and delivered in line with a shared vision and values. Proactive and meaningful engagement of communities in coproducing these changes is vital if they are to succeed. That’s why Healthcare Improvement Scotland is committed to ensuring that people and relationships are at the centre of how we work and all we do. It’s also why the role of the Scottish Health Council – a key part of Healthcare Improvement Scotland – is being reviewed to ensure that it is best placed to help make that happen. Since 2005, the Scottish Health Council has worked in many different ways with NHS boards across Scotland to help them improve how they engage with people and communities. This role has developed over time, and in the last few years the Scottish Health Council has increasingly been working across both health and social care, gathering people’s views directly to inform service and policy development, and playing a key role working with partners in shaping and implementing the Our Voice framework. The consultation on the Scottish Health Council, which took place between July and October 2017, provided a timely reminder of the multiplicity of individuals and organisations that have a shared interest and commitment to improving health and social care policy and services through better engagement. 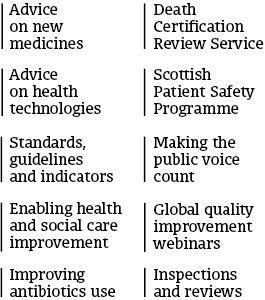 Healthcare Improvement Scotland received 175 responses, from a wide range of stakeholders including members of the public, patient representatives and public partners, community groups and third sector organisations, NHS boards, Integration Authorities, and national representative bodies. We are grateful to all of them for giving their views on how the Scottish Health Council can better support engagement in the changing health and social care environment. The responses we have received all underline the importance of the design and delivery of services being shaped by those who use them. They also highlight the potential for the Scottish Health Council to collaborate more effectively with others in making that happen. We all have our own views and ideas about ‘making care better’. Only by sharing, listening and learning, and building on those views and ideas will this aspiration be truly realised. The consultation on the Scottish Health Council has now closed but you can find more information about the review on our website. It is probably just an oversight but my previous comment, posted over two weeks ago, has not yet been published. Sunshine Act for Scotland: PE1493. Tomorrow, 22 March 2018, will mark two years since the Scottish Health Council published its consultation on a Register of Interests for NHS Scotland. Tomorrow, I will be protesting outside the Scottish parliament tomorrow as the Scottish Government has not troubled itself to explain to the people and the parliament of Scotland why it has taken two years to effectively change nothing. The voices of the people have been heard but is the Scottish Government listening? The answer would seem to be NO. Two years and there has been no “conversation”. This is not the “realistic medicine” that I passionately support. This all would seem to indicate that “our voice” is not actually ours. The Scottish Health Council should be independent of Healthcare Improvement Scotland and its working partners: the Scottish Government and the “not for profit” American Institute for Healthcare Improvement.